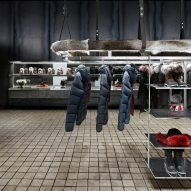 A display rack for winter coats is covered in fur and suspended from leather straps inside this Toronto store, designed by local studio Burdifilek. The flagship for Canadian jacket brand Moose Knuckles features dimly lit interiors intended to evoke winter's frigid darkness. Burdifilek selected black walls, hot-rolled steel and pale tile floors create a minimal feel inside the shop, which is interspersed with rounded dark volumes, glass and mirrors. The focal point is an oval-shaped rack that hangs from the ceiling on black leather straps. The frame is wrapped in caribou fur, concealing the section where hangers hook on to. 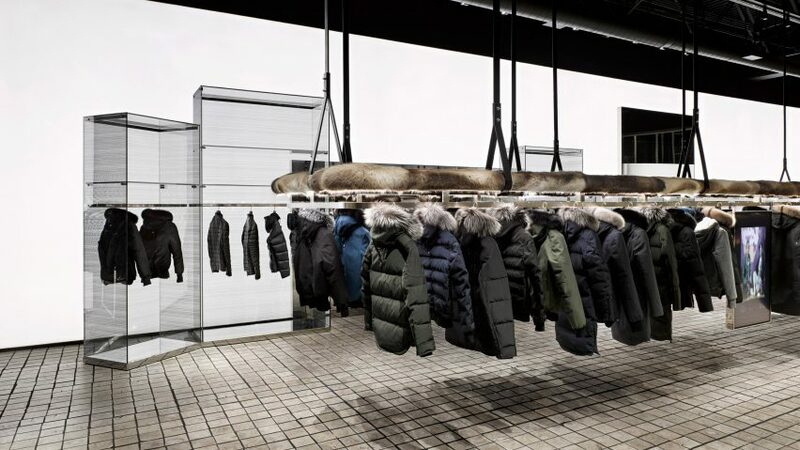 Dozens of fluffy-hooded parkas are displayed on the rack, above rustic tile floors. "The end-cut black locust block flooring [was] inspired by the Prada Foundation in Milan," said Burdifilek. A curved form that disguises the cash register was derived from the shape of the Moose Knuckles logo. At the front of the store is a circular fitting room, where shoppers can catch glimpses of customers trying on items. Another unexpected element is the full-height glass wall at the rear, which allows to peer into the stockroom. "Reflecting the brand's risqué and unapologetic attitude, the store subverts the traditional conventions of retail design, rethinking key elements such as the store's sightlines, its displays, and its stock and fitting rooms," said a project description from the studio. 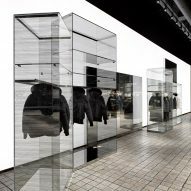 Glass cabinets designed to resemble icebergs are used to display limited-edition pieces. Other glowing elements like high-resin mirrors and a white screen add glossy touches. Overall, these details are all suggestive of Canada's snowy winters. Founded in Canada in 1921, Moose Knuckles manufactures most of its parkas, bombers and jackets in the country, and the brand prides itself on its quality and durability. The label uses factories in Winnipeg, furriers in Toronto, and a design team in Montreal. "Everything we do here is Canadian to the core," states the brand's website. "We inject millions of dollars annually in the Canadian economy, while preserving a tradition of Canadian craftsmanship." The Moose Knuckles store in Toronto aims to reflect this ethos by showcasing the craftsmanship of its products. "Seeing the space inspired us to establish two or three design moves to make a real statement for the brand," said Burdifilek creative director Diego Burdi. Burdi co-founded the studio with Paul Filek, and the team is also behind the design of a culinary shop in their home city.